A detective returns to London to investigate a strange double murder – or does he? – in THE GHOUL, the moodily seductive low-budget directorial feature debut from actor Gareth Tunley. Slarek gets in the loop on Arrow's recently released Blu-ray. an evil spirit or phantom, especially one supposed to rob graves and feed on dead bodies. a person morbidly interested in death or disaster. Note that second one, as that's the type of ghoul that triggers the storyline in Gareth Tunley's intriguing feature debut. At least it is at first. A homicide detective named Chris (Tom Meeten) travels from an unspecified location in northern England to London to investigate a strange double murder, one in which the victims apparently continued to advance on their assailant after receiving a number of what should have been fatal gunshot wounds. The ghoul in question here is Michael Coulson (Rufus Jones), who has since become the manager of the property in which the murders took place and seems to have a morbid fascination for crime scenes. Chris suspects he may know more than he's letting on, so elects to go undercover as a patient of Coulson's psychotherapist Helen Fisher (Niamh Cusack) with the aim of sneaking a look at Coulson's psychiatric file. When Helen is taken ill, both Chris and Coulson are referred to the considerably more gregarious Alex Morland (a lively performance from Geoffrey McGivern), but as Chris becomes more deeply wrapped up in his role, he increasingly has trouble differentiating reality from increasingly unsettling fantasy. And that's the setup. Or is it? Chris hasn't been in therapy long before an alternative narrative offers itself up, that he is in fact a troubled psychotherapy patient who imagines he is a detective investigating a double homicide case. That he offers this explanation to Helen as a personal fantasy comes across initially as part of his cover story, albeit a slightly risky one, given that he's offering up the truth to someone he's trying to deceive. Yet one aspect of his opening up to Helen prompts immediate pause for thought, as his early film hook-up with former girlfriend and crime scene analyst Kathleen (Alice Lowe) is followed a short while later by a manufactured chance encounter in a park in which they appear to be meeting for the first time since university. It's left to us to decide which version is real and which is the product of Chris's imagination. To get too deeply into the complexities of what happens to Chris, or at least what Chris thinks is happening to Chris, risks robbing first-timers of the pleasures and frustrations that come with attempting to untangle a narrative that initially seems determined to resist such analysis. On my first viewing, I became quickly wedded to one interpretation of events, while the second time around it seemed obvious from an early stage that I'd been mistaken on this score. Yet having embraced this alternative reading, a stoned-out comment during a trippy party sequence led me to question whether I might have been right the first time after all. Chris's introduction to the concept of the Möbius strip is crucial to how this all develops and eventually unravels. More effective when working subtextually than when it is briefly and unnecessarily overstated as a handwritten call to action in the final scene, it shapes Chris's psychosis and even the motorway that brings him into London, and drawn on paper in simplified form becomes the mathematical symbol for infinity, which itself has implications for how we are invited to interpret what unfolds. The Ghoul is the directorial feature debut of actor Gareth Tunley, who had roles in Down Terrace and Kill List, both of which were directed by Ben Wheatley, who acts as executive producer here (Tunley also had an uncredited cameo in Wheatley's blackly comic Sightseers, whose co-star Alice Lowe plays Kathleen in The Ghoul). Given that we spend the entire film inside Chris's head, it's not the easiest of first-time directing gigs, but Tunley does well here, resisting the temptation to overplay the visual psychosis and cluing us into the fact that we've been to a drab-looking property before by filming its approach the same way on both occasions. His influences do show, from Christopher Nolan's Following to David Lynch's Lost Highway, and while the borrowings occasionally play almost like small fanboy nods, this never feels like an open homage to the work of others and incorporates these elements in to a consistently dark and troubling whole. He's aided immeasurably by Tom Meetan's authentically haunted performance as Chris (if you told me he'd starved himself and became strung out on drugs for a few months in preparation for this role, I'd believe it in a heartbeat), Benjamin Pritchard's moody digital cinematography and the ominous strains of Waen Shepherd's score. Some have criticised the film for the slenderness of its narrative, for not exploring its central concept in more depth, and for the relentless nature of its glumly downbeat tone. All three claims have some validity, but a film doesn't have to be narrative driven or be structured around the emotional highs and lows of traditional three-act drama to be valid as cinema. 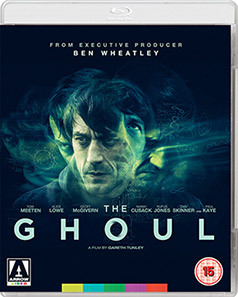 Film is second only to literature in its ability to get inside the head of its protagonist and tell a story exclusively from their viewpoint, and on this score The Ghoul really delivers the goods. There's a strong expressionist element to the gloominess of London as seen through Chris's eyes, and the film as a whole is an impressively low-key object lesson on what you can do with an interesting idea on even the smallest of budgets. And if the first viewing makes your head spin, give it a second shot and appreciate just how precisely the process of unravelling the truth – whatever it may be – has been plotted and executed. The Ghoul was shot on the Canon C300 HD camera, with a few shots recorded on the low-budget filmmaker favourite of recent years, the Canon 5D DSLR. The resulting image has been matted to 2.35:1 and is clean and generally crisp, only having a slightly softer feel when the light levels plummet. And this is often a very dark film, graded to reflect Chris's worldview and so (intentionally) gloomy in places that I couldn't see detail at all on my plasma when the room was soaked in daylight, though I had no issues at all watching by evening lamplight. The image is sharp and vibrant in brighter daylight scenes, and the contrast spot on. There is some (just) visible banding on a wall in the darkly lit scene when Chris returns to his flat 15 minutes in, but I'm guessing this is down to the original footage or the post-production work rather than the transfer. On the whole, a damned fine job. No problems at all with the DTS-HD Master Audio soundtrack, which is cleanly recorded and splendidly mixed, making inclusive use of the surrounds for ambient sound and music and delivering some thumping bass when required. Optional English subtitles for the deaf and hearing impaired are available. As audio commentaries go, this has to be one of the best intentioned I've heard in a while, as director Gareth Tunley, producer Jack Guttmann and leading man (and producer) Tom Meeten take us on a trip through the making of what was clearly a micro-budget production, the aim being to provide tips for hopeful first-timers who find themselves in a similar position. And having worked on just such a film myself, it was almost comforting to hear how many of the very same problems they encountered, from extraneous noise at locations over which you have no control to their low cost approach to getting dolly shots – having to artificially sharpen some shots in post-production due to focus issues caused by a wobbly slider also prompted a memory shudder on my part. There's plenty of discussion on and appreciation for Waen Shepherd's music score, some engaging anecdotes about individual cast members, and a few choice examples of how original ambitions had to be scaled back due to the lack of funds. An enthralling listen. A newly shot featurette in which key members of the cast and crew recall how they met whilst performing at the Edinburgh Festival (you'd never guess from the film's dark tone that so many of those involved in its production came from a comedy background), the formation of the Ealing Live! comedy group, their early TV work, the development and making of what was clearly a micro-budget film, the support offered by Ben Wheatley (who is also interviewed), the long post-production period, the difficulties getting it picked up for distribution and a whole lot more. A very useful companion to the film. Some brief but welcome behind-the-scenes footage is also included. A 2013 short film directed by Gareth Tunley and starring Steve Meeten in a role he created during his time with the Ealing Live! comedy group. Meeten plays a meek office worker who imagines himself as a pantomime embodiment of evil named The Baron in a would-be sinister take on Walter Mitty daydreams that concludes on the sort of limp twist that will doubtless prompt a fair few cries of “Is that it?” Sightseers' Steve Oram (who once had a comedy double-act with Meeten) also features, and a couple of the components do play like sketch-level trial runs for aspects of the far more substantial feature to follow. A snappily edited trailer that captures the essence of the movie well but inevitably ups the pace. On the basis of this, I'd have bought a ticket. The first pressing also includes a booklet featuring writing on the film by Adam Scovell, author of Folk Horror: Hours Dreadful and Things Strange, but this was not available for review. The Ghoul is an intriguingly conceived, confidently realised and convincingly performed low-budget first feature that may not be quite as complex or twisted as it may seem on a first viewing, but remains captivating and unsettling in the way it gets inside the head of its troubled central character. A solid transfer is complimented by an illuminating making-of documentary and a useful commentary, and Tunley's earlier short film is on board for completists. Recommended.